Starved Stuff by Matt Townsend – Discount! 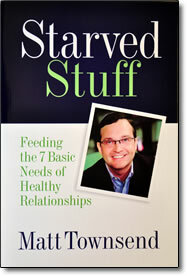 STARVED is an acronym for the 7 basic needs that are critical to all healthy relationship. Too often we stress and fight about the symptoms rather than the root cause of conflict. Matt refers to this as fighting the smoke, not the fire. Here are the 7 basic needs that every relationship must have in order to thrive. Does your relationship need a boost in these areas?